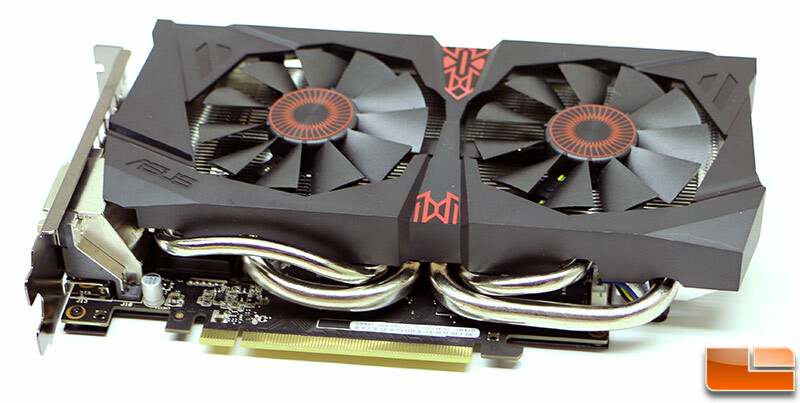 The ASUS STRIX GTX960 DirectCU II OC 2GB video card features the usual black design with red accents and measures in at 215.2 x 121.2 x 40.9 mm in dimension. That would be just 8.5-inches in length, so this card is fairly small and will have no issue fitting inside the vast majority of PC cases on the market now or in yesteryear. The STRIX GTX 960 has a 5-phase Super Alloy Power design that should give you plenty of smooth power and minimal choke noise. 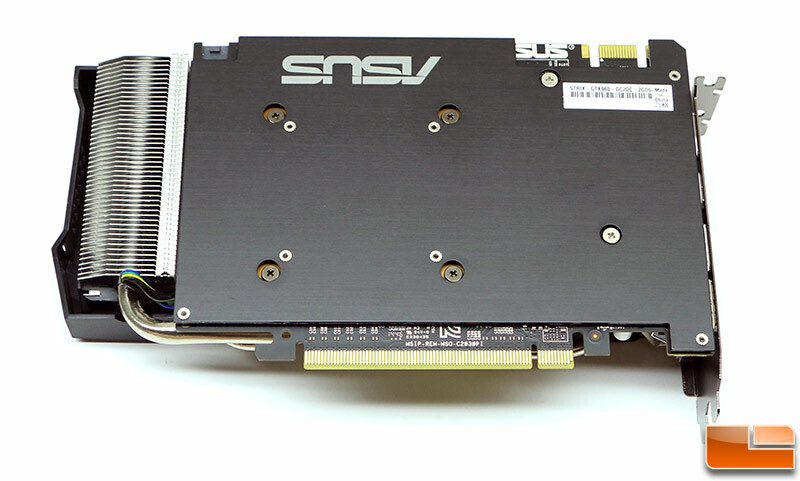 Along the top edge of the STRIX GTX960 you’ll find a single NVIDIA SLI multi-GPU interconnect and then a rear-facing 6-pin PCIe power connector. ASUS even put LED indicator lights below this power connector to ensure you connect the power properly. If the LED light is white you have the power cable completely plugged in and it is feeding the card power properly. If the LED indicator light is red it means that you don’t have the power connector pressed in tight enough or there is a power supply issue. 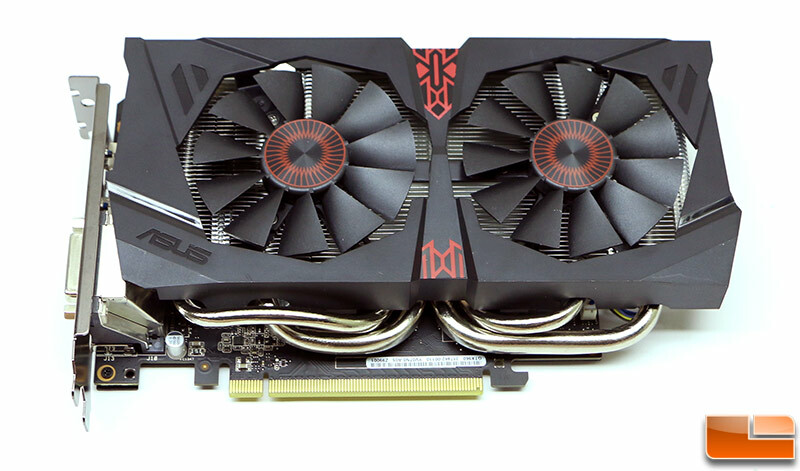 The ASUS STRIX GTX 960 DC2OC might be a mainstream graphics card, but it comes with a black back plate to help protect the components on the back of the card and it helps lower the PCB temperature. ASUS went with three DisplayPort 1.2 outputs as well as single HDMI 2.0 and Dual-Link DVI-I when it comes to video outputs. ASUS includes a DVI to VGA adapter in the accessory bundle, so the STRIX-GTX960-DC2OC-2GD5 should be able to connect to pretty much any monitor that you own or that is coming out in the years ahead. 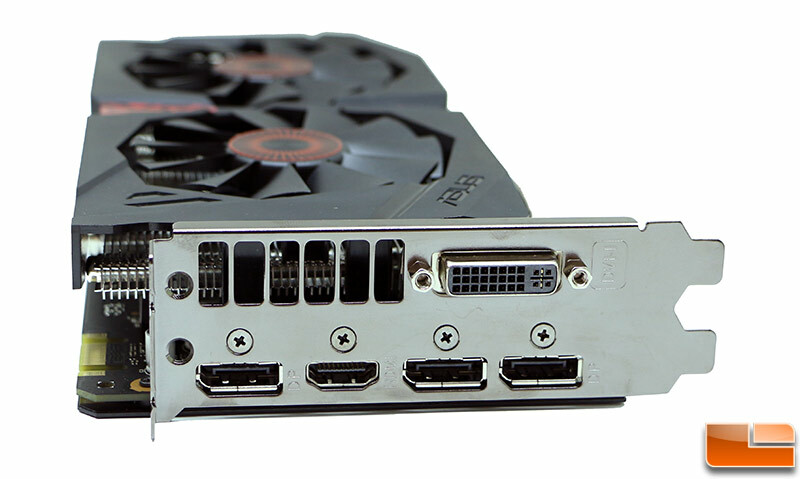 It is nice to see some many DisplayPort connections as that it what you need to run NVIDIA G-Sync monitors and you can easily run a set of them out of the box with this card. Here you can make out the four large heat pipes that make up the DirectCU II GPU cooler. These heat pipes don’t make direct contact with the GPU, but they connect to the copper base plate that does. 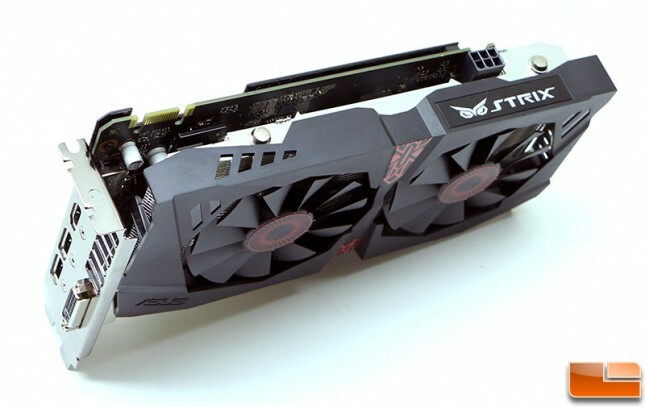 The heatsink on this card is 220% larger than the NVIDIA reference design and there are dual 80mm cooling fans being used on the STRIX GTX 960. The DirectCU II GPU cooler design is certainly one of the big selling points of this video card. The ASUS STRIX GTX960 features a DirectCU II GPU cooler with 0dB fan technology. On this particular model that means the fans don’t kick on until the GPU temperature hits ~55C. This means when you aren’t gaming or are playing games that only slightly load the GPU the fill will likely not kick on! 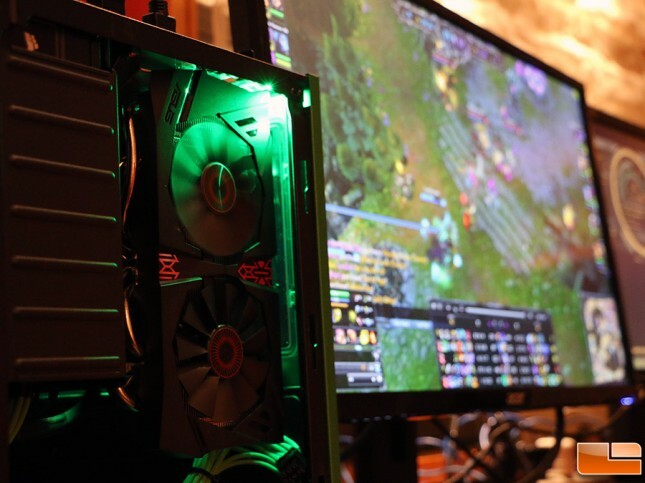 We found that in game titles like League of Legends that the ASUS STRIX GTX 960 often had no running at all and at other times one or two fans would kick in. The image above shows just one fan running with the card around 52C. 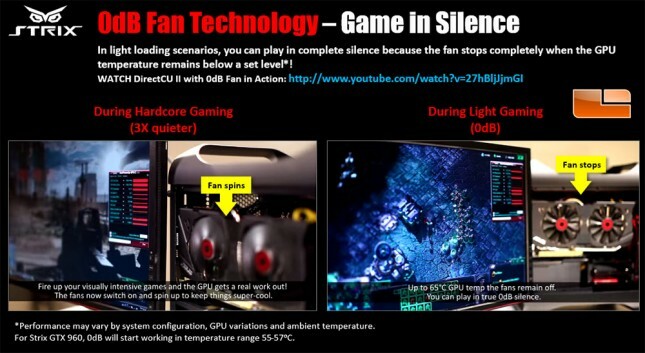 The reason both fans didn’t kick in is because there are slight variations between fans as we were told by ASUS that there shouldn’t be a single fan mode. 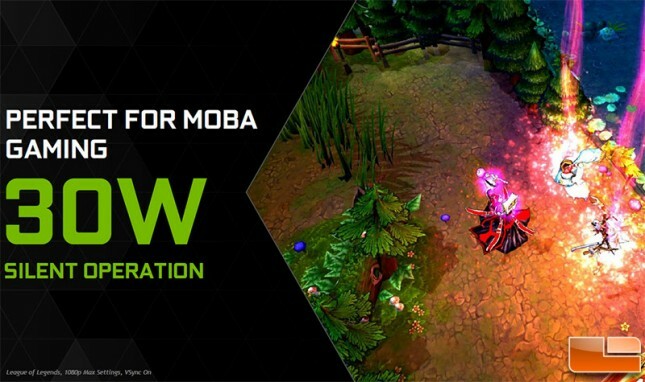 NVIDIA said that most Multiplayer Online Battle Arena (MOBA) game titles will be able to run in silent operation! The ASUS GeForce GTX 960 STRIX will be able to take advantage of the latest GPU Tweak software from ASUS. 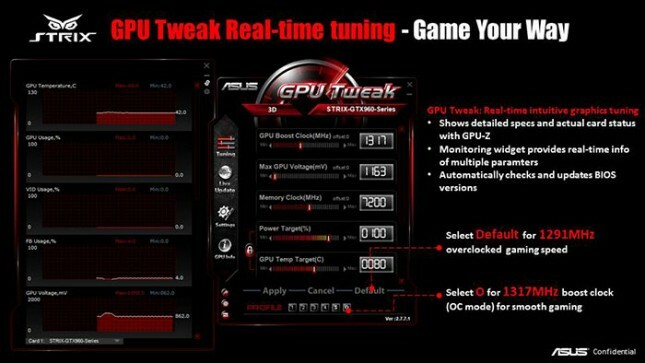 The GPU Tweak software is able to display the specifications of the card, as well as the current status of of the card. The Tweak software also has a couple of overclocked presets that you can take advantage of, or you can make your own presets for the card. 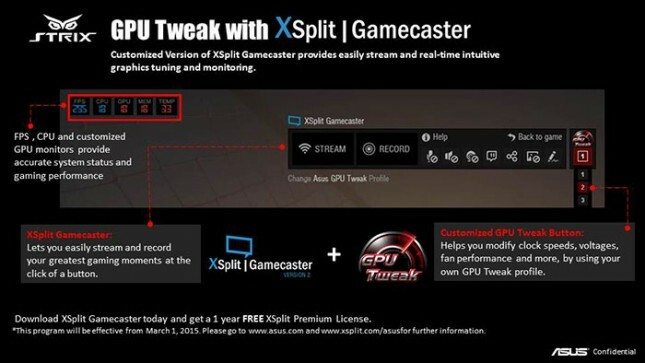 The GPU Tweak software comes with a customized version of XSplit Gamecaster. The Gamecaster and GPU Tweak work together as an overlay on your games. The Gamecaster can be configured to stream you game and/or record your gameplay while the GPU Tweak software will let you change your settings on the fly through the presets. Now that we have a good understanding of what the NVIDIA GeForce GTX 960 brings to the table and how ASUS used the GM206 GPU to design the STRIX GTX 960 2GB video card we can take a look at the test system and get straight into testing!